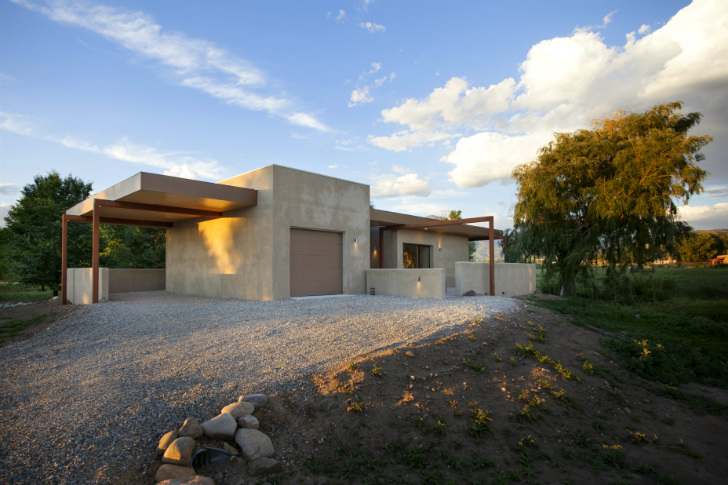 TAOsHouse is a net-zero energy home in Taos, New Mexico that also boasts a Passive House certification. Designed by Santa Fe-based firm NeedBased, run by Jonah Stanford, this home was built for a couple in their 60s and will adapt to allow them to age in place along with other seniors in a co-housing community. Completely powered by just a 2 kW rooftop solar system, the TAOsHouse is highly insulated and hyper efficient and filled with sustainable materials inside. The TAOsHouse is located in Valverde Commons, which is a sustainably oriented, adult co-housing community just a 15-minute walk from Taos’ historic plaza. The three bedroom, two bathroom house was built for a couple in their 60s and incorporates aging-in-place design that increases flexibility for whatever health changes may occur down the road. Surrounded by a beautiful landscape, TAOsHouse weaves in public and private spaces to enjoy the views, the sun and the community. The interior is filled with natural light and finished with earth-pigmented plaster walls, floor to ceiling bamboo casement work, and concrete floors. Besides designing a home that could be used for generations and one that interacted with the landscape, Jonah Stanford of NeedBased, also designed the home to be highly sustainable with energy efficient systems, high-performance materials and eco-friendly finishes. The home is net zero energy, certified by the the Passivhaus Institute in Germany and has an Emerald rating from the National Home Builders Association. The home features hydronic radiant floors, heat recovery ventilation, solar passive design with thermal mass and a high-performance envelope to minimize energy losses. All this adds up to a home that requires very little energy, in fact, TAOsHouse only has nine (9!) 230 watt PV panels to make it net zero. Surrounded by a beautiful landscape, TAOsHouse weaves in public and private spaces to enjoy the views, the sun and the community. Besides designing a home that could be used for generations and one that interacted with the landscape, Jonah Stanford of NeedBased, also designed the home to be highly sustainable with energy efficient systems, high-performance materials and eco-friendly finishes. The home is net zero energy, certified by the the Passivhaus Institute in Germany and has an Emerald rating from the National Home Builders Association. The three-bedroom, two-bathroom house was built for a couple in their 60s and incorporates aging-in-place design that increases flexibility for whatever health changes may occur down the road. The interior is filled with natural light and finished with earth-pigmented plaster walls, floor to ceiling bamboo casement work, and concrete floors. The home features hydronic radiant floors, heat recovery ventilation, solar passive design with thermal mass and a high-performance envelope to minimize energy losses. All this adds up to a home that requires very little energy, in fact, TAOsHouse only has nine (9!) 230 watt PV panels to make it net zero. 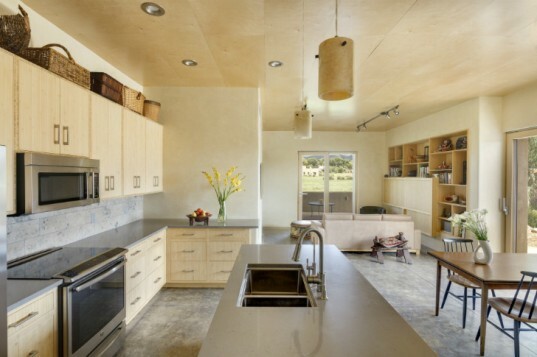 All of the cabinets were built with bamboo plywood. “Energy conservation and efficiency are designed into a Passive House from the beginning, versus relying on complex systems to make it comfortable or reduce its energy use after it’s built,” says Jonah Stanford, NEEDBASED’s principal. “Mechanical systems cost money to repair and replace. The TAOsHouse is located in Valverde Commons, which is a sustainably oriented, adult co-housing community just a 15-minute walk from Taos’ historic plaza.